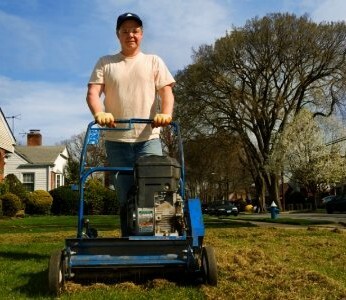 Do you have an area in your yard where grass will not grow? Or a slope that seems to be eroding with every rainfall? If so, then a groundcover may be the solution. These low-lying plants can grow where grass and other more delicate plants cannot. The definition of a groundcover is a low growing plant (less than 24 inches) that spreads easily by producing rhizomes or stolons. These plants form dense vegetation, which chokes out weeds and makes them virtually maintenance free. Why are groundcovers so useful in your yard? They help prevent soil erosion. Root systems mat together and hold soil in place. They help prevent weeds. Their matted roots and dense growth patterns keep weeds from taking hold. They define a space. They also provide a transition between lawn and flower beds. They soften hardscapes. Walkways, steps and driveways look less severe. They fill awkward spaces. They are great to place between pavers or rocks. They grow where grass will not. Many groundcover plants can survive in poor soil conditions and shady areas. They are drought tolerant. They need less water than traditional grasses. They mostly withstand foot traffic. 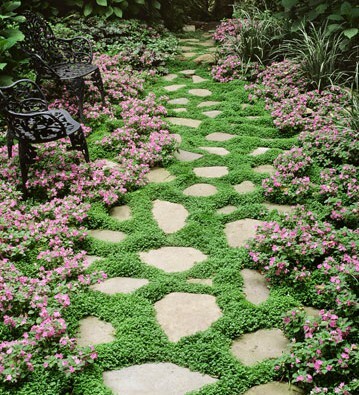 Groundcovers such as moss, thyme and turfgrass don’t mind a little walking. Determine the area you want to plant groundcover. Is it shady or in full sun? Does the ground drain well or stay moist? This will help you decide what types of plants to select. Herbaceous plants will lose their leaves in the winter so if you are trying to cover a bare area then go with evergreen plants. Ground covering plants can be creepers (vines and fast spreading plants), carpeters (like moss or turfgrass) or clumpers like Hostas. If you are trying to fill in a large area quickly, then maybe a creeper type is what you need. For variety, try mixing together all three types. Just determine each plant’s maximum growth range and space them out accordingly. 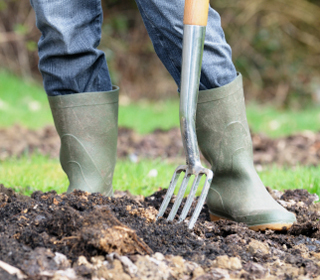 As with all plantings, starting with good healthy soil is important. Prepare the bed by adding compost or organic material. Arrange the plants you’ve selected in a staggered or diamond pattern to allow them to fill in faster. Space out your plants. Give creepers more room to spread out than the clumping types. Remember that a fast spreading creeper may become invasive if not kept in check. Just keep an eye on them. After planting be sure to cover with a thick layer of mulch to keep the weeds under control until the groundcover can fill in. The mulch will also provide protection during the winter months. Groundcover plants will take a couple of growing seasons to establish and completely fill in the area. Groundcovers are an easy solution to most landscape challenges. 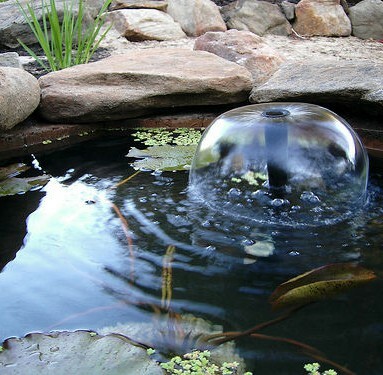 They can also be used to create some very interesting focal points in your yard. Mother Nature has provided you with every texture and color you can think up for your garden palette. Let your imagination run wild.